Yesterday I got an email message from a friend from junior high in Italy. I can believe she found me! We had not been in touch for about 15 years. 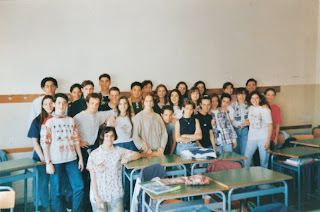 Here is a class picture taken in 1994 of my class. I'm on the front row on the right. In Italy you have the same class mates for 5 years (unless they don't pass the grade) and the teachers come to the class. I remember that the classroom where the photo was taken had a big window almost the size of one entire wall. One day as we were sitting in class, we began to feel the ground trembling. It was an earthquake. Our teacher had us all hide under our desks to protect us from any debris. Luckly the glass didn't break. I was with that group for only three years before moving to the US to attend high school. When I left our class had only 15 kids. The rest had been held back because of grades. By the time the class reached the 5th year there were only four left. I'm glad I had some good friends in Jr high to hang out with, because it was rough at times. They say Jr high is the hardest, what do you think?